Learn how one of the web’s biggest accidental success stories evolved. Google is currently the leading search engine by a large margin, but it owes a lot to AltaVista. In the early days of the web, AltaVista broke ground in search technology. It pioneered many techniques that search engines still use today, and was the first tool to index the full text content of web pages. 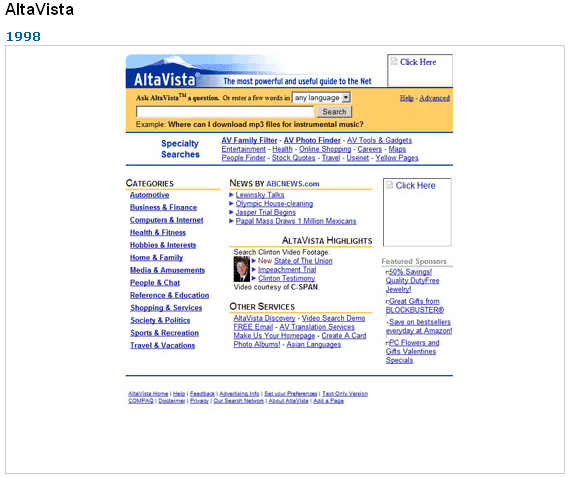 When AltaVista was in its prime, Google didn’t exist. But Google didn’t take long to dispose of its rival and force it into the arms of Yahoo. The demise of AltaVista is a cautionary tale for any successful online business. Despite being a pioneer, and far more advanced than its competitors, it proved fallible when its users deserted it. Various search engines offered lists of the content available online, compiled using user submissions and manual indexing. Naturally, manually created directories had a limited lifespan. Once the web began to explode in popularity, there was no way they could cover every site. All search engines or directories had a shared problem; they all showed different results. And they couldn’t automatically find new websites, either. W3Catalog was the first search engine to automatically harvest website data and format it in a searchable database, but it relied upon other directories for its listings. There was a clear opportunity for a new competitor to offer a complete search database, compiled through automated scanning. Ironically, the search engine that eventually filled this position did so almost by accident. AltaVista was officially launched in 1995 by Digital Equipment Corporation, which was known simply as ‘Digital.’ Digital was the original owner of the domain that you’re reading now; www.digital.com. That’s why AltaVista’s original URL used a subdomain of it: altavista.digital.com. ThisDayInTechHistory has a screenshot of its original homepage design. AltaVista was not created to take the internet by storm, or tap into a booming commercial opportunity that its developers had spotted. In fact, AltaVista was essentially a test case for one of Digital’s supercomputers, the AlphaServer 8400 TurboLaser. With its 64-bit processor, it could search very large databases very quickly. A search engine was an obvious demonstration of its might. AltaVista’s name came from the scenic views in Palo Alto, where Digital was based. Louis Monier created the web crawler tool, Scooter. He was a computer scientist at Digital’s Western Research Lab. Scooter completed its first complete web crawl in August 1995, returning around 10 million pages to the primitive AltaVista index. Paul Flaherty is credited with coming up with the idea for AltaVista, while Michael Burrows is credited for writing the indexer itself. After being tested with Digital’s 10,000 employees, the AltaVista search engine was rolled out to the general public on December 15th of the same year. AltaVista quickly became a hit with web users. It indexed around ten times the number of pages that competing search engines could handle. Visitors could suddenly access more content than ever before, simply because AltaVista was better at indexing the furthest reaches of the web. And it gave them more control over results, too. At first, there was some uncertainty around whether AltaVista would continue to be provided free to the general public, or whether users would be asked to pay. But Digital saw AltaVista as a useful demo of its computer hardware capabilities; a marketing tool. AltaVista’s popularity as a search engine was secondary to Digital’s goal of showing what its server could do. However, Digital underestimated just how much users would love AltaVista. On its launch day in 1995, the new search engine saw around 300,000 visitors. One year later in 1996, it was serving 19 million visitors each day. And by 1997, it was attracting 80 million visitors daily. By 1998, it required 20 multi-processor servers to carry out all of the search queries it received. AltaVista was the first search engine to allow users to search for things using natural language. This meant that typing, for example, “What is a server”, would return search results about servers, not the words “what”, “is”, and “a”. It was the first search engine to attempt to create a complete index of the web using its own data, rather than a curated directory of listings or partial results compiled from different sources. Its crawler, Scooter, was capable of indexing full text pages, making AltaVista the first searchable full text database of the web. It broadened the use of boolean operators in search. Like some competing search engines, it supported AND, OR, and NOT. But it also supported two additional operators: NEAR and ( ) (parentheses). It allowed searchers to limit the amount of results that were returned from one domain. That cut back in noise and duplicate pages in results, which was important in an age where duplicate content on the web was commonplace. It was the first to allow multi-lingual search. It launched mirror sites in Malaysia and Spain in 1997. It was the first to allow people to search for images, video, and audio alongside text content. It was the first tool that could translate entire websites to (and from) English, Spanish, French, German, Portuguese, Italian, and Russian. It did this using its Babel Fish translator, which would later become part of Yahoo. AltaVista’s relationship with Yahoo started in 1996, when it began to provide supplementary results for Yahoo’s search portal queries. From this point, AltaVista entered a turbulent phase that eventually resulted in it being acquired by its key rival. Compaq’s Internet Services division decided that it would try beat Yahoo at its own game by diversifying its features. It turned AltaVista into a more complex web portal, doing away with the simple search form that users had enjoyed before, and replacing it with an increasingly cluttered homepage. This move away from AltaVista’s streamlined search experience made AltaVista more similar to its competitors. Users gradually began to switch to a newcomer, Google, for the simple search they missed. In 1999, 83% of AltaVista was purchased by CMGI, owners of the Lycos search engine. It was valued at around $2.3 billion, and an IPO was on the cards. But by 2001, its IPO was canceled and staff were laid off as CMGI reportedly struggled to make AltaVista profitable. Around this time, Google surpassed AltaVista’s popularity with users, processing more search queries than its rival for the first time. AltaVista began to backtrack on its portal layout experiment and return to a simple search form, but the damage was already done. 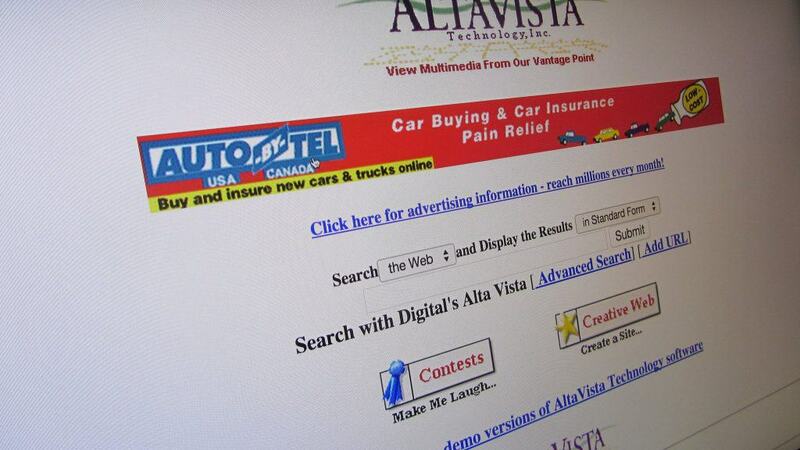 The ailing AltaVista brand was acquired again in February 2003 for just $140 million by Overture. Then, Yahoo acquired Overture four months later, which marked the beginning of the end for the AltaVista name. All of the search technology that had been built up under the AltaVista brand was absorbed into Yahoo search in 2011, just as its search results had been co-opted by Yahoo 15 years earlier. Yahoo closed AltaVista quietly in 2013. AltaVista arguably never had a fair shot at reaching its full potential. It was an accidental success story for Digital, which saw it as a marketing tool rather than a useful service in its own right. With hindsight, it’s easy to see how popular web search would become. But AltaVista was the victim of poor strategic direction at the height of its success. By the time AltaVista was considered a serious search tool, its focus was changed to a portal, and users didn’t like it. And while acquisitions and financial struggles had been playing out for AltaVista, Google started to gain ground. Additionally, Google foresaw a problem with spam and low quality search results. Its 1996 search engine BackRub was based on a primitive version of PageRank. This approach gave it an important advantage as spam on the web increased. Many experts believe that Yahoo was rather hasty in its decision to close AltaVista without fanfare. It was criticized for having a similar attitude towards GeoCities, too. But by the time AltaVista was closed in 2013, the internet community had moved on; the people that mourned its demise almost certainly didn’t use it for search any longer. AltaVista was considered a dinosaur of the web by the time Yahoo closed it down. But it was hugely important in changing users’ expectations of search. And while lacked the right strategic direction to give it an edge over Google, it paved the way for modern search engines and proved that it was possible for one single website to index (almost) the entire web.